Our Craft Events team have been hard at work and have arranged a couple of amazing workshops for the months ahead. 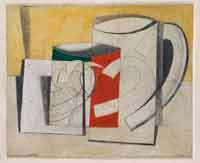 In April we’re being given the opportunity to try out some abstract pottery inspired by the St Ives school of potters including Breon O’Casey, Alfred Wallis and Ben Nicholson. The end results will (hopefully!) be a table centre-piece or wall hanging. Prices are £40 for members and £50 for non-members. July sees us all learning to Crochet at The Wool Shop on Orchard Street with owner Laura who runs this wonderful relaxed and inspiring shop. Prices are £7.50 for members and £10 for non-members. Please note that this is a beginners class.